The break-in happened at the Stedham Sawmills base of Strudwick Scaffolding, in Midhurst, in the early hours of Tuesday morning (January 29). Director Dean Strudwick said: “We turned up for work this morning and the yard was near enough empty. “The thieves had used bolt cutters to cut padlocks. “I believe it’s a job that has been thought about and whoever it was came here numerous times to see how we worked. Two white drop side Ford Transits (reg nos YN63EUH and BNO6MYG) were stolen valued at £16,000 along with equipment and tools and two motor cross bikes each worth around £3,000, according to police. Police forensic teams were at the site on Tuesday. Anyone with information should contact police quoting 212 of 29/01. 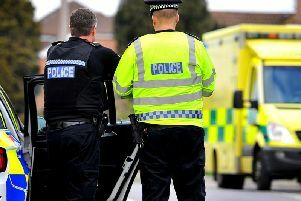 A police spokesman said: “All lines of enquiry will be investigated. “If anyone witnesses any suspicious behaviour in this area at this time please report online or call 101 quoting 212 of 29/01.